ClearVu® technology ensures outstanding image and sound clarity so that you can watch and listen to your child up to 450ft away.1 Feel free to move around the house and no matter where you go, you will always see your baby. With Levana, youll never miss a moment. Many studies indicate that your babys room should be between 61-68° F (16-20° C). This system is equipped with temperature monitoring so you can monitor the temperature in your babys room and know that they are always safe and comfortable. Sooth your baby from a distance with the talk-to-baby intercom. With the simple press of a button you can let your baby know you are on your way to their nursery or simply talk to them until they fall back to sleep without having to go into his or her room. Choose from 5 different lullabies to sooth your baby to sleep. Turn lullabies on and off as well as change the song being played all from the parent unit with the simple push of a button. Choose from Blue Danube, Silent Night, Twinkle Twinkle, Minuet in G Major, and Londonderry Air. The built-in night vision allows you to see your child, even in complete darkness up to 10ft away. When the lights go down the system automatically adjusts to the level of light. 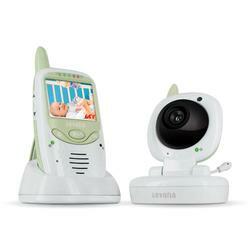 The camera can be placed anywhere in your childs room while still displaying a precise image of your baby. When youre not on the move, simply put your monitor on its base to recharge – no batteries required! Enjoy up to 4 hours of continuous audio and video monitoring with a fully charged unit. The baby unit has a gentle night light that you are able to turn on and off from the parent unit. Turn the light on if your baby is getting restless to calm them and turn it off when your baby is asleep, all without going into the babys room. The monitor has LED lights on it that light up to display up to five different levels of sound. This means you can turn the volume all the way down, relax and still know when and how much noise your baby is making. The camera can be wall mounted so you can easily view your baby in its crib as well as see all other parts of the nursery. This unique feature allows you to monitor your babies every sound without any loud disturbances. Simply turn on the vibrate function and the parent unit will vibrate whenever any noise is detected in your babys room. Along with power saving features, the integrated rechargeable battery ensures long battery life for up to 4 hours of monitoring. The table-stand also functions as a belt clip for ultra usability. Place the monitor upright with the table stand when you are in the same room. You can also carry the monitor with you and still have both hands available by using the belt clip. The power adapters save you on power all while saving the environment. They are rated with a Level V efficiency standard which means they are 30% more energy efficient then other conventional power adapters.